The Kettle Korn House is a mobile concession business based in Pepin, WI. Unlike most vendors who use stainless-steel pots, we make our kettle corn in a seasoned cast iron kettle. The result is a hand-crafted artisan-style kettle corn popcorn that stands apart from commercial kettle corn vendors. In business for nearly 25 years, the Kettle Korn House is "Always a Good Choice!" The Kettle Korn House, manned by RCTC Alum - Joel, made our Centennial Celebration a POPPIN' success! We were super excited to have him come to our event; he was great to work with and the stand was a favorite among the attendees and workers. The kettle corn was popped fresh and was super delicious. We would highly recommend the Kettle Korn House as a vendor at any event! Kettle Korn House was a vendor at our Port Washington Maritime Heritage Festival in mid-August this year and it was delicious. Very nice, professional set up and great korn. I highly recommend! 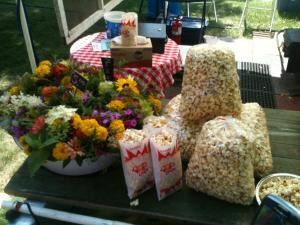 We loved having Kettle Korn House at our Squash Blossom Farm Fair & Cow Puja! The kettlekorn fragrance was irresistible and it tasted delicious. Everyone enjoyed seeing the korn freshly made right there in front of them in the traditional cast iron kettle and chatting with the friendly kettlekorn master, Joel. We held our all employee picnic in September on our corporate grounds in Eagan. We greatly appreciated the fact that Joel showed up very prepared and enthusiastic about our event-not to mention, the kettle korn was amazing! Joel keeped popping even after the event ended so that our teardown team could enjoy some delicious kettle korn. I highly recommend Joel for any event! Having Joel's Kettle Korn House at our Norman Borlaug Harvest Fest in Cresco, Iowa was a great addition. The aroma helps put everyone in a good mood as does his overall positive attitude. Gotta have more Korn! I highly recommend Kettle Korn House as a great vendor for your next event. Joel is great and easy to work with. He delivers a high quality product. Everyone at our event raved about the kettle corn. Joel and his unique display was such a welcomed addition to our big screen movie night during our 23rd Annual Kasson Festival in the Park. From his genuine pleasantries to his corn stalk props - Joel with Kettle Korn House is a definite plus to any event, large or small! The Kettle Korn House was a fantastic addition to our big screen movie night during Kasson's Festival in the Park! Not only is Joel's unique display eye catching, his genuine personality was a true "treasure". Thank you, Joel House! Joel did a fantastic job popping Kettle Korn for our event at the U of M! It was a very hot day, and he powered-through to ensure that everyone who attended got their bag of corn. We had several staff members compliment Joel and his tasty kettle korn, plus, he's a very entertaining guy! I highly recommend Joel. Kettle Korn House has been a vendor at the Kickapoo Valley Reserve's Winter Festival for the past two years. Their yummy kettle korn has been a great addition to our event. Joel is easy to work with and delivers a quality product. Thanks! Kettle Korn House came to our Big Hogs for Small Dogs fundraiser. They were there for the after party at Boomers and made EXCELLENT kettle corn! We loved having Kettle Korn House at our fundraiser and the customers loved it too!